Let’s say we are trying to build a model that will detect cats in photographs. The average resolution of images in ILSVRC is \(482\times 415\), with three channels (RGB) this makes the typical input size \(482\times 415\times 3=600,090\). Each hidden unit connected to the input in a multilayer perceptron would have 600K parameters, a single hidden layer of size 1000 would have 600 million parameters. Too many parameters cause two types of problems: (1) today’s GPUs have limited amount of memory (4G-12G) and large networks fill them up quickly. (2) models with a large number of parameters are difficult to train without overfitting: we need a lot of data, strong regularization, and/or a good initialization to learn with large models. One problem with the MLP is that it is fully connected: every hidden unit is connected to every input pixel. The model does not assume any spatial relationships between pixels, in fact we can permute all the pixels in an image and the performance of the MLP would be the same! 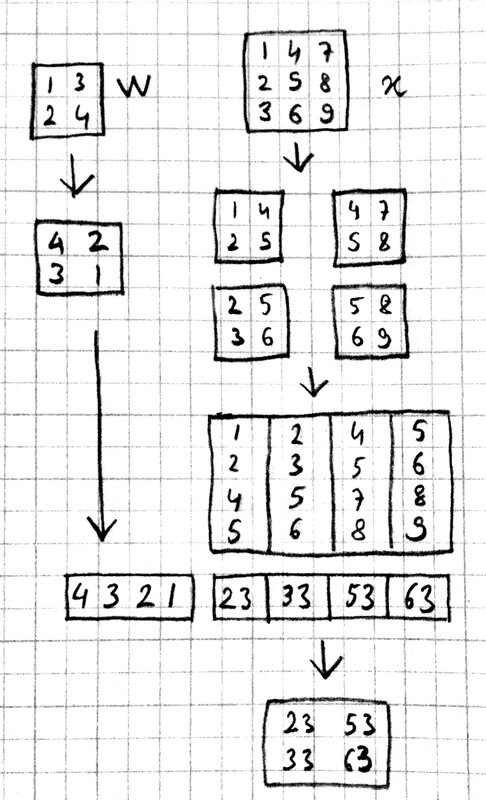 We could instead have an architecture where each hidden unit is connected to a small patch of the image, say \(40\times 40\). Each such locally connected hidden unit would have \(40\times 40\times 3=4800\) parameters instead of 600K. For the price (in memory) of one fully connected hidden unit, we could have 125 of these locally connected mini-hidden-units with receptive fields spread around the image. The second problem with the MLP is that it does not take advantage of the symmetry in the problem: a cat in the lower right corner of the image is going to be similar to a cat in the lower left corner. This means the local hidden units looking at these two patches can share identical weights. We can take one \(40\times 40\) cat filter and apply it to each \(40\times 40\) patch in the image taking up only 4800 parameters. A convolutional neural network (aka CNN or ConvNet) combines these two ideas and uses operations that are local and that share weights. CNNs commonly use three types of operations: convolution, pooling, and normalization which we describe next. conv4 is the convolution operation in Knet (based on the CUDNN implementation). For reasons that will become clear it works with 4-D and 5-D arrays, so we reshape our 1-D input vectors by adding extra singleton dimensions at the end. The convolution of w=[1,2,3] and x=[1,2,3,4,5,6,7] gives y=[10,16,22,28,34]. For example, the third element of y, 22, can be obtained by reversing w to [3,2,1] and taking its dot product starting with the third element of x, [3,4,5]. 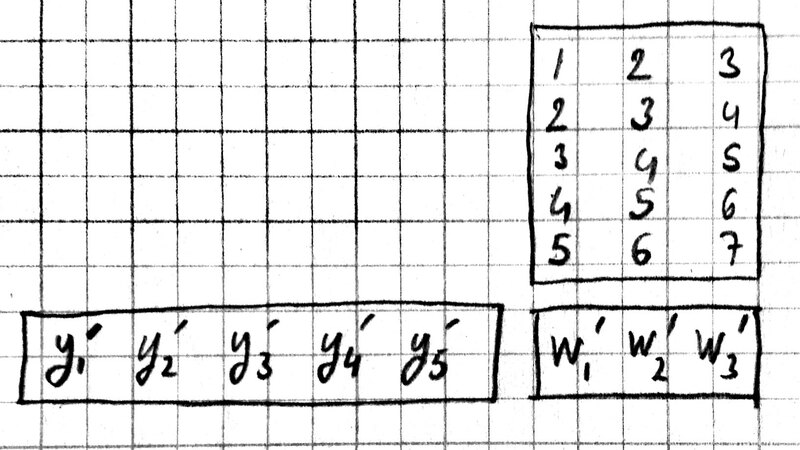 In the last example, the input x had 7 dimensions, the output y had 5. In image processing applications we typically want to keep x and y the same size. For this purpose we can provide a padding keyword argument to the conv4 operator. If padding=k, x will be assumed padded with k zeros on the left and right before the convolution, e.g. padding=1 means treat x as [0 1 2 3 4 5 6 7 0]. The default padding is 0. For inputs in D-dimensions we can specify padding with a D-tuple, e.g. padding=(1,2) for 2D, or a single number, e.g. padding=1 which is shorthand for padding=(1,1). The result will have \(Y=X+2P-W+1\) elements where \(P\) is the padding size. Therefore to preserve the size of x when W=3 we should use padding=1. For example, to calculate the first entry of y, take the dot product of the inverted w, [3,2,1] with the first three elements of the padded x, [0 1 2]. You can see that in order to preserve the input size, \(Y=X\), given a filter size \(W\), the padding should be set to \(P=(W-1)/2\). This will work if W is odd. This option would be important if we were hand designing our filters. However the mode does not matter for CNNs where the filters are learnt from data, the CNN will simply learn an inverted version of the filter if necessary. When the input x has multiple dimensions convolution is defined similarly. In particular the filter w has the same number of dimensions but typically smaller size. The convolution operation flips w in each dimension and slides it over x, calculating the sum of elementwise products at every step. The formulas we have given above relating the output size to the input and filter sizes, padding and stride parameters apply independently for each dimension. and adding the results gives you the first entry 23. The padding and stride options work similarly in multiple dimensions and can be specified as tuples: padding=(1,2) means a padding width of 1 along the first dimension and 2 along the second dimension for a 2D convolution. You can use padding=1 as a shorthand for padding=(1,1). The first D dimensions \(X_1\ldots X_D\) determine the spatial extent of the image. The last dimension \(C\) is the number of channels (aka slices, frames, maps, filters). The definition and number of channels is application dependent. We use C=3 for RGB images representing the intensity in three colors: red, green, and blue. For grayscale images we have a single channel, C=1. If you were developing a model for chess, we could have C=12, each channel representing the locations of a different piece type. The first D dimensions \(W_1\ldots W_D\) determine the spatial extent of the filters. The next dimension \(I\) is the number of input channels, i.e. the number of filters from the previous layer, or the number of color channels of the input image. The last dimension \(O\) is the number of output channels, i.e. the number of filters in this layer. Note that the number of input channels of the input data and the filter bank always match. In other words, a filter covers only a small part of the spatial extent of the input but all of its channel depth. where I is the number of channels as before, and N is the number of images in a minibatch. The convolution implementation in Knet/CUDNN use D+2 dimensional arrays for both images and filters. We used 1 for the extra dimensions in our first examples, in effect using a single channel and a single image minibatch. basically adding an extra dimension of 128 at the end of each data array. By the way, the arrays in this particular example already exceed 5GB of storage, so you would want to use a smaller minibatch size if you had a K20 GPU with 4GB of RAM. Note: All the dimensions given above are for column-major languages like Julia. CUDNN uses row-major notation, so all the dimensions would be reversed, e.g. \([N,I,X_D,\ldots,X_1]\). Convolution can be turned into a matrix multiplication, where certain entries in the matrix are constrained to be the same. The motivation is to be able to use efficient algorithms for matrix multiplication in order to perform convolution. The drawback is the large amount of memory needed due to repeated entries or sparse representations. The first approach turns w into a \(Y\times X\) sparse matrix, wheras the second turns x into a \(W\times Y\) dense matrix. In addition to computational concerns, these examples also show that a fully connected layer can emulate a convolutional layer given the right weights and vice versa, i.e. convolution does not get us any extra representational power. However it does get us representational and statistical efficiency, i.e. the functions we would like to approximate are often expressed with significantly fewer parameters using convolutional layers and thus require fewer examples to train. which can be recognized as another cross-correlation operation, this time between \(x\) and \(y'\). This allows us to write \(w'=y'\star x\). which can be recognized as the matrix multiplication equivalent of the cross correlation operation \(w'=y'\star x\). You can recognize this as a regular convolution between \(w\) and \(y'\) with some zero padding. Goodfellow, I. (2010). Technical report: Multidimensional, downsampled convolution for autoencoders. Technical report, Université de Montréal. 312. Bouvrie, J. (2006). Notes on convolutional neural networks. UFLDL tutorial and exercise on CNNs. It is common practice to use pooling (aka subsampling) layers in between convolution operations in CNNs. Pooling looks at small windows of the input, and computes a single summary statistic, e.g. maximum or average, for each window. A pooling layer basically says: tell me whether this feature exists in a certain region of the image, I don’t care exactly where. This makes the output of the layer invariant to small translations of the input. Pooling layers use large strides, typically as large as the window size, which reduces the size of their output. Like convolution, pooling slides a small window of a given size over the input optionally padded with zeros skipping stride pixels every step. In Knet by default there is no padding, the window size is 2, stride is equal to the window size and the pooling operation is max. These default settings reduce each dimension of the input to half the size. With window size and stride equal to 2, pooling considers the input windows \([1,2], [3,4], [5,6]\) and picks the maximum in each window. With a window and stride of 3 (the stride is equal to window size by default), pooling considers the input windows \([1,2,3],[4,5,6]\), and writes the maximum of each window to the output. If the input size is \(X\), and stride is equal to the window size \(W\), the output will have \(Y=\lfloor X/W\rfloor\) elements. In this example, window=stride=2 by default and the padding size is 1, so the input is treated as \([0,1,2,3,4,5,6,0]\) and split into windows of \([0,1],[2,3],[4,5],[6,0]\) and the maximum of each window is written to the output. With padding size \(P\), if the input size is \(X\), and stride is equal to the window size \(W\), the output will have \(Y=\lfloor (X+2P)/W\rfloor\) elements. As we saw in convolution, each data array has two extra dimensions in addition to the spatial dimensions: \([ X_1, \ldots, X_D, I, N ]\) where \(I\) is the number of channels and \(N\) is the number of instances in a minibatch. Karpathy says: “Many types of normalization layers have been proposed for use in ConvNet architectures, sometimes with the intentions of implementing inhibition schemes observed in the biological brain. However, these layers have recently fallen out of favor because in practice their contribution has been shown to be minimal, if any.” (http://cs231n.github.io/convolutional-networks/#norm) Batch normalization may be an exception, as it is used in modern architectures. S. Lyu and E. Simoncelli. Nonlinear image representation using divisive normalization. In CVPR, pages 1–8, 2008. N. Pinto, D. D. Cox, and J. J. DiCarlo. Why is real-world visual object recognition hard? PLoS Computational Biology, 4(1), 2008. Batch Normalization: This is more of an optimization topic. We have seen a number of new operations: convolution, pooling, filters etc. How to best put these together to form a CNN is still an active area of research. In this section we summarize common patterns of usage in recent work based on (Karpathy, 2016). The operations in convolutional networks are usually ordered into several layers of convolution-bias-activation-pooling sequences. Note that the convolution-bias-activation sequence is an efficient way to implement the common neural net function \(f(wx+b)\) for a locally connected and weight sharing hidden layer. The convolutional layers are typically followed by a number of fully connected layers that end with a softmax layer for prediction (if we are training for a classification problem). It is preferrable to have multiple convolution layers with small filter sizes rather than a single layer with a large filter size. Consider three convolutional layers with a filter size of \(3\times 3\). The units in the top layer have receptive fields of size \(7\times 7\). Compare this with a single layer with a filter size of \(7\times 7\). The three layer architecture has two advantages: The units in the single layer network is restricted to linear decision boundaries, whereas the three layer network can be more expressive. Second, if we assume C channels, the parameter tensor for the single layer network has size \([7,7,C,C]\) whereas the three layer network has three tensors of size \([3,3,C,C]\) i.e. a smaller number of parameters. The one disadvantage of the three layer network is the extra storage required to store the intermediate results for backpropagation. Thus common settings for convolution use \(3\times 3\) filters with stride = padding = 1 (which incidentally preserves the input size). The one exception may be a larger filter size used in the first layer which is applied to the image pixels. This will save memory when the input is at its largest, and linear functions may be sufficient to express the low level features at this stage. The pooling operation may not be present in every layer. Keep in mind that pooling destroys information and having several convolutional layers without pooling may allow more complex features to be learnt. When pooling is present it is best to keep the window size small to minimize information loss. The common settings for pooling are window = stride = 2, padding = 0, which halves the input size in each dimension. Beyond these general guidelines, you should look at the architectures used by successful models in the literature. Some examples are LeNet (LeCun et al. 1998), AlexNet (Krizhevsky et al. 2012), ZFNet (Zeiler and Fergus, 2013), GoogLeNet (Szegedy et al. 2014), VGGNet (Simonyan and Zisserman, 2014), and ResNet (He et al. 2015). Design a filter that shifts a given image one pixel to right. Design an image filter that has 0 output in regions of uniform color, but nonzero output at edges where the color changes. If your input consisted of two consecutive frames of video, how would you detect motion using convolution? Can you implement matrix-vector multiplication in terms of convolution? 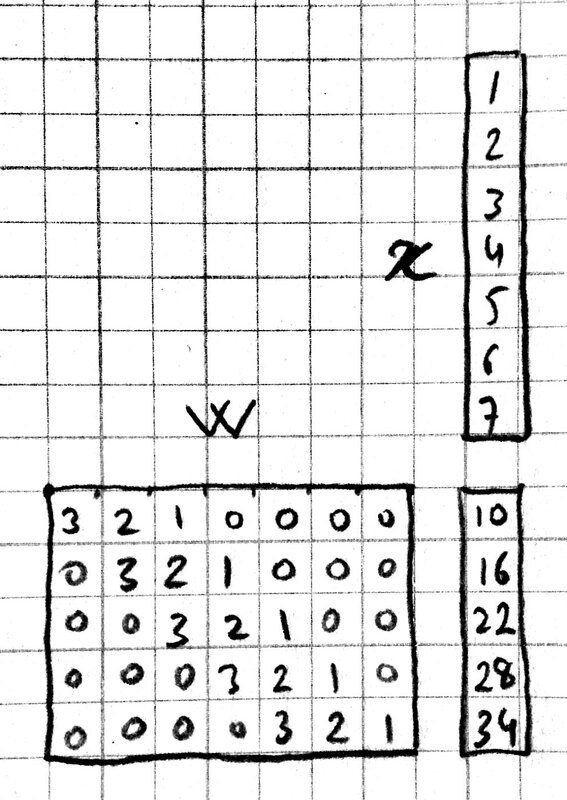 How about matrix-matrix multiplication? Do you need reshape operations? Can you implement convolution in terms of matrix multiplication? Can you implement elementwise broadcasting multiplication in terms of convolution? UFLDL (or its old version) is an online tutorial with programming examples and explicit gradient derivations covering convolution, pooling, and CNNs. http://scs.ryerson.ca/~aharley/vis/conv/ has a nice visualization of an MNIST CNN. (Thanks to Fatih Ozhamaratli for the reference). http://josephpcohen.com/w/visualizing-cnn-architectures-side-by-side-with-mxnet visualizing popular CNN architectures side by side with mxnet. http://cs231n.github.io/understanding-cnn visualizing what convnets learn.